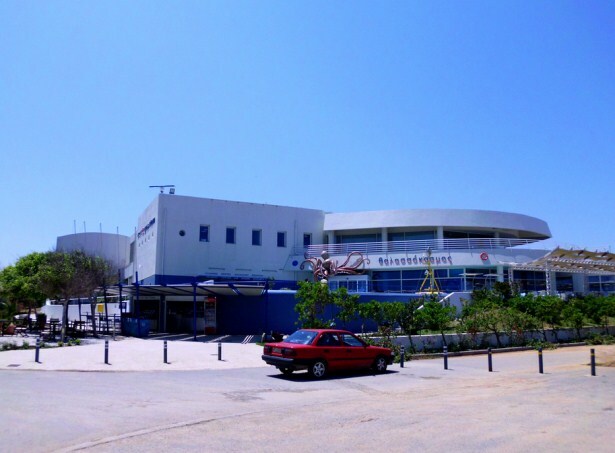 Aquaworld Aquarium and Reptile Rescue Centre in Hersonissos was founded in 1995 with a mission to encourage interest in marine life and reptiles in general, and in those of the local area in particular. It is situated at the west end of Hersonissos, 30km east of Heraklion and 40km west of Agios Nikolaos. Aquaworld hosts a selection of fish and non-fishy marine life found in the seas around Crete, many of which are on display on any given day. Additionally, it hosts native reptiles found in Crete, many of which are quite tame and can be handled and photographed by visitors. Rather than collecting perfectly healthy animals from the wild, however, the aquariums and terrariums are full of creatures which had already been captured and, in many cases, which were about to die, or even have become unwanted and uncared for pets.